The Royal Society of New Zealand and the Office of the Prime Minister’s Science Advisory Committee has released a PDF document, The Canterbury Earthquakes: Scientific answers to critical questions. Questions addressed range from the nature of the aftershocks to predicting earthquakes, the differences between the September 4th 2010 magnitude 7.1 and February 22nd 2011 magnitude 6.3 earthquakes and others. An audio recording of the press conference associated with the release of this document is available soon at the Science Media Centre. Update (3:53pm): a transcript of his introductory speech is now also available as a PDF file; this particular includes remarks on understanding probability, risk and hazards. 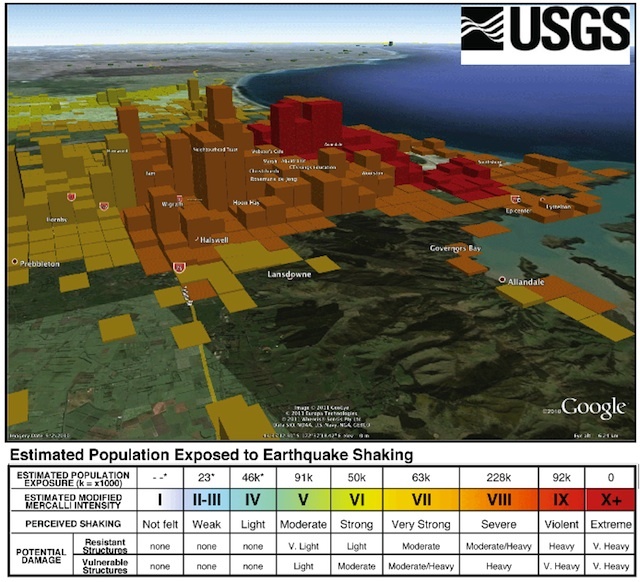 The document features an excellent infographic from USGS relating the number of people in each part of the city and shaking levels in that part of the city (using the MMI scale). 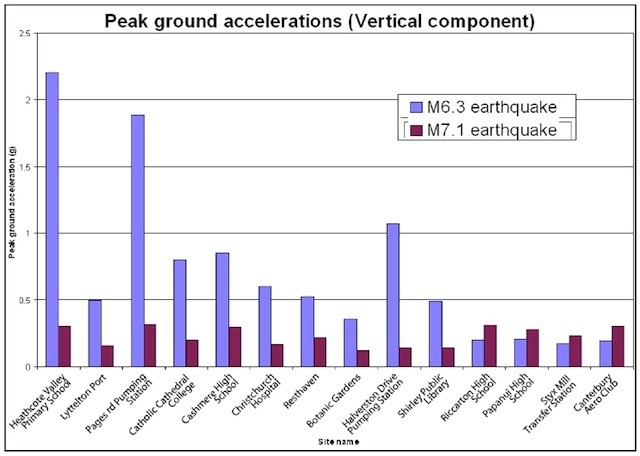 It also shows two graphs breaking down the peak ground accelerations into it’s horizontal and vertical components. I’ve included copies of them below as teasers to encourage readers to read the document. It looks as if the slides from the presentations are only available to registered journalists. I personally would have liked to have seen these open-access for on-line distribution. It may be that these are the same as those in the document, in which case nothing is being missed! Updated first link to a more permanent source.